So the results are starting to come out for the OU exams taken in June. Those who were on their last module have got their final degree classification and for the rest of us we’re getting our individual module scores. Despite not being due for another 8 days, the results for MS221 came out today. If you’ve been following my blog you’ll know that I really hadn’t focused on studying for this module as much as I should and, with a new role taking up my time in the evenings and weekends I just hadn’t revised as much as I should have done. I even took my text books to the ReWork DL conference in Boston but only opened them briefly on the plane on the return flight. So how did I do? So, a few days ago I tweeted that I had this snippet from World of Warcraft going round my head where Illidan taunted that we weren’t prepared for what awaited us. It was how I felt going into MS2211 and now that I’ve done the exam I wanted to reflect on why I’d ended up feeling unprepared for a test in a subject I am very enthusiastic about for a degree I’m doing for no direct gain other than for the fun of learning. I started this degree back in 2013 because I was intellectually unstimulated in my job. I was busy, spinning many plates and wasn’t bored, but there just wasn’t anything to do that really set my neurons firing. I’d started the process of looking for another job for a whole host of reasons I won’t go into, but I could feel my brain getting “comfortable” at not having to think much beyond which of my team needed to do which task in what order in response to changing priorities. So I signed up to do the maths degree I’d always wished I’d done. 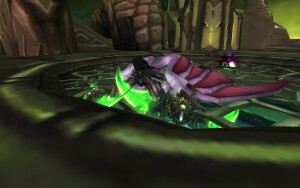 Continue reading MS221 – was Illidan right? So – I’m approaching the end of my third OU module, MS2211, and the exam is in a few days. I missed all the local revision tutorials through being away with work2 and, despite some good intentions, I am woefully behind. Consider this a crammer’s guide for learning university level mathematics in 3 and a half days 😉3. This morning I had a tutorial for module MS221 of my OU Maths degree. In addition to complex numbers, groups, and proofs one of the topics we covered was RSA encryption and decryption. As I’m a little behind in my study I’m going to use this post to explain how this type of encryption works (even though this is already covered elsewhere e.g. in wikipedia). You’re going to need a little maths to follow this, but hopefully not too much! Firstly, a quick recap. Public-private key encryption means that you have a pair of keys – the public one you can give out without a care and anyone can use this to encrypt messages to you. Without the private key to decrypt, it’s practically impossible to decipher the encrypted messages, so as long as you actually keep your private key private, everything is (relatively) safe. As an aside, if your private key is obtained by someone else then they will be able to read your messages and you would never know. I have to say it – I’m three modules in to my OU degree and, while I regularly promise to set aside time for study, I always find myself doing no more that a three hour tutorial and then a further 3-6 hours doing the assignments and this has done the trick so far. There’s always something that gets in the way and eats up that time – something I’d rather be doing… and it’s not because I’m not enjoying it – I love maths and am somewhat annoyed with myself that I’m missing out on the richness of the OU course by cutting straight to the specific examples I need to complete the coursework. So why am I not doing the work? Possibly the key reason is that I am currently able to get away with it. Why spend more time when I can do what I’m doing and get distinctions? Surely this is an efficient use of my time. I’m hardly a role model to students anywhere by doing this… but I doubt I’m the first. Continue reading Taking my degree seriously?